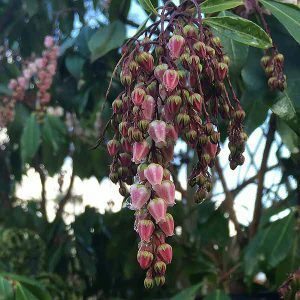 An evergreen shrub with pink and white bell shaped flowers Pieris japonica Flamingo flowers in mid to late winter. With flowers appearing in dense racemes, the new buds are red, opening to bell shaped pink and white. This is a naturally dense growing plant that requires little to no pruning. Flowering is improved with more sun. we find that a position beneath a deciduous tree is ideal. Here the plant will get the sun it needs in winter to spring, and then dappled shade through the heat of summer. With very attractive flowers Pieris japonica Flamingo looks great when planted along the edge of a low retaining wall where its flowers are lifted up a little. Also suited to growing on containers. Water Pieris Flamingo in well with a liquid seaweed fertiliser. Mulch to maintain a cool moist root run. Flowers – Pink with flushes of white. Foliage – New foliage is a bronze to red that will turn to a mid to deep green as it matures.